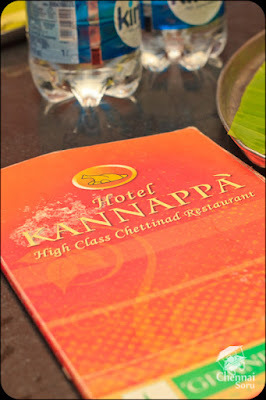 Finally had an opportunity to relive the fantastic gastronomic food at Hotel Kannappa at Trichy on my recent drive to Karaikudi. Big thanks to the married couple Mrs & Mr. Sathapan for making this trip happen. 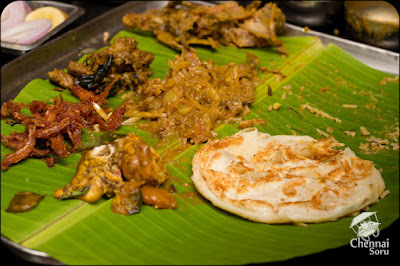 What happens when a bunch of carnivores walk into non-veg paradise and go on an all out attack? Here is the rest of the story. Seven hungry souls enter for lunch. Let me just list out what all we had and then try to explain them down. I know the list is little huge. But we licked each dish clean. 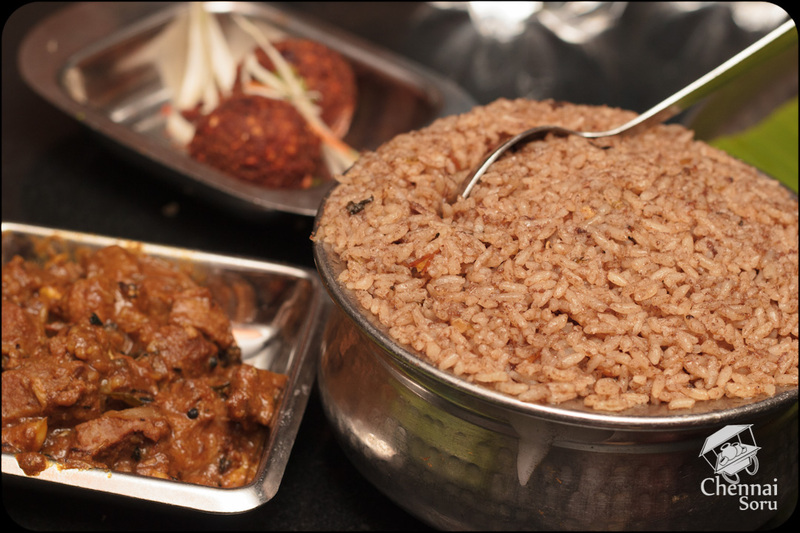 Firstly a comparison between the Basmati Rice and Seraga Samba rice. My pick will be Seraga Samba hands down. Basmati rice had a very mild flavour and just could not hold its head with the Seraga Samba. Both the biryani had wholesome pieces of mutton. Mutton Kola Urundai Vanished at the same speed it was served. Yummy Yummy... Mutton Brain was sort of an introduction for a few people in our group. I must say they loved it. Too bad they missed it all this while. Nethili was crispy fry and fresh. It just kept going in. Chicken Chukka too was fantastic. But I was too occupied with Brain and Nethili. The only dish which was not upto my liking was the Pigeon Masala. Found the taste a little weird even when it had the similar masala to Chicken Chettinadu. Could be because I have never eaten pigeon before or I could not pull meat apart from the bone. Chilli Parotta was kind of like a appetiser for us. We just finished that in no time. I did not get to taste the paneer so I will reserve judgement on it. 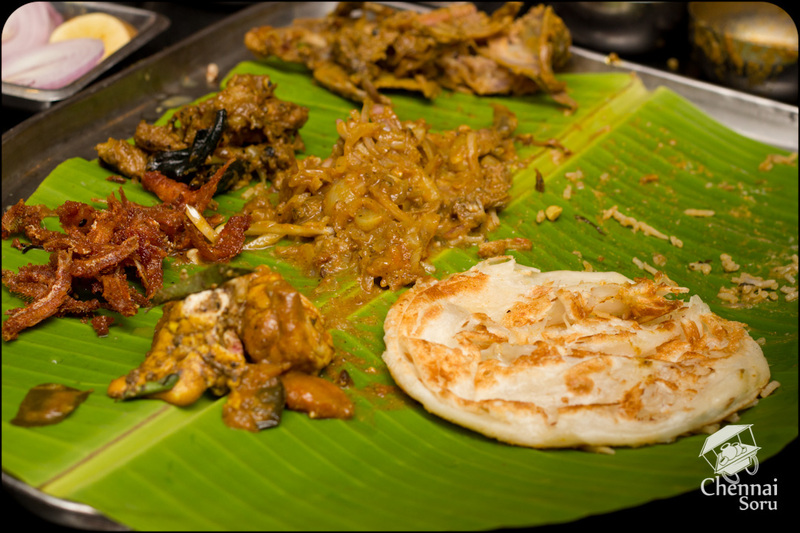 All in all the Kannappa is a proper non-veggies paradise. A place to dine if you happen to pass through Trichy. The Falooda and Tuti Frooti were almost identical except for the swap of vanilla ice cream for strawberry ice cream. The restaurant has an ambiance similar to your Anjappar and Ponnuswamy. No complaints here. It was quick and efficient. Very attentive and they put up with our over exuberance. Hotel Kannappa Chettinad is located inside Grand Gardenia at Mannapuram Junction, Trichy.